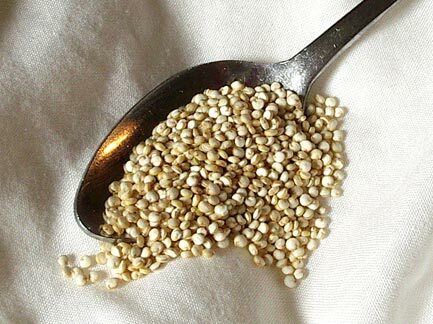 Quinoa (pronounced KEEN-wah) is the seed of a plant commonly grown in the Andes mountains of South America and is the main staple of many South American countries. It cooks just like rice and can be used easily as a healthier substitute for rice or couscous. It is also eaten as a breakfast food with honey, milk and almods. It has a very pleasant, nutty flavor and nice chewy texture. Quinoa is high in protein (12%-18%) and has a complete set of amino acids unlike most other grains. This makes quinoa especially good for vegans and vegetarians that don’t get protein from animal products. Quinoa is also high in fiber, phosphorous, magnesium and iron. It also has no gluten. Quinoa is also very low on the glycemic index with a value of 35. Foods with a low glycemic index are great for diabetics and anyone watching his/her weight. By comparison brown rice has a glycemic index of 50, white rice 85, and corn syrup 115 (which goes into many commercially processed foods). There is a very complete article of quinoa at Wikipedia. Cook quinoa just like you cook rice except use 2 cups water for every cup of quinoa. 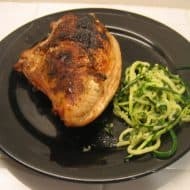 If you search online you will find many recipes that use quinoa. Quinoa also comes ground as a flour that can be used in recipes calling for rice, oat, or other flours that contain no gluten. I like quinoa but every time I made it I found something crunchy/gritty in it and it made me throw it out. I thought it was just me but when I asked others who have tried it, they said the same thing. Any way to avoid this? I never had that problem. I would try buying quinoa from a different source. Ilive in In. where can I buy it to try. Pretty much every supermarket sells quinoa. It’s going to be in the section where the rice is. If you have a Whole Foods market near by, they’ll also have it in the bulk section in addition to packaged grains. While you’re at it, also check out millet. It’s also really tasty and versatile. I love rice but have developed an allergy to it. So I tried Quinoa. I love it. We first made it without any other flavors to learn about the basic taste. It does have a slight crunch to it that I really like as well. The basic flavor is good. I really liked it with steak mixing some of the juices off of a grilled stead mix with the Quinoa was great too. I tried it for the first time tonight. It was a great compliment to steak. I am using the left overs tomorrow for breakfast to replace the oatmeal. The kids loved it. Will use thus from now on instead of rice 2 out if 3 times.